In early April of 1982, Argentina invaded the Falkland Islands, a few desolate rocks in the South Atlantic. The British mobilized their fleet, sending it south by way of Ascension Island. On the 25th, a force retook South Georgia, a even smaller and more desolate island that Argentina had also captured, while the main task force closed in on the Falklands. May 1st saw the British launch their attack. The Argentine Navy tried to interfere the next day, but withdrew after the cruiser General Belgrano was sunk by a submarine. 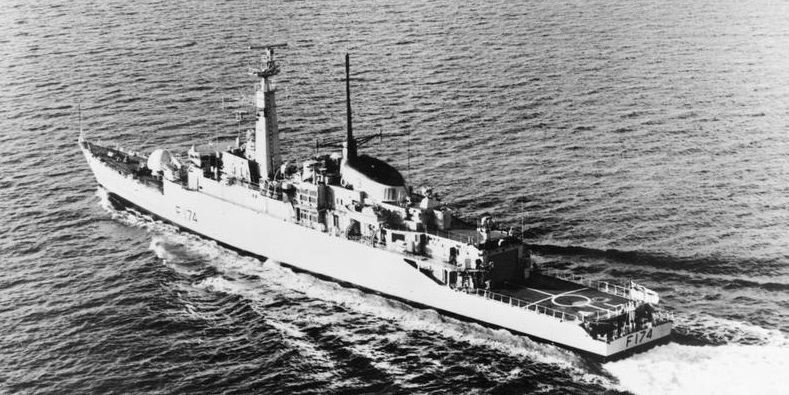 Two days later, the Argentinians struck back, sinking the frigate Sheffield with an Exocet missile. After the attack on Sheffield, both sides settled in for a long siege. The British needed to cut the Argentine defenders off from reinforcements and wear them down during the two weeks it would take for the amphibious force to arrive. The Argentines needed to wear down the British, denying them the sea and air superiority required to make an amphibious landing practical. The task of both sides would be complicated by the weather, which was about to take a turn for the worse. The 5th was quiet, as weather closed the main Argentine bases. The only action was an Argentine submarine hunt near the mainland, in an area where there were no British submarines. It's likely that the Argentines were no better than the British at distinguishing whales from submarines, and killed an innocent marine mammal. The British had their own environmental confusion that night, when a potential blockade-runner was identified as a rock by a low-light TV camera. 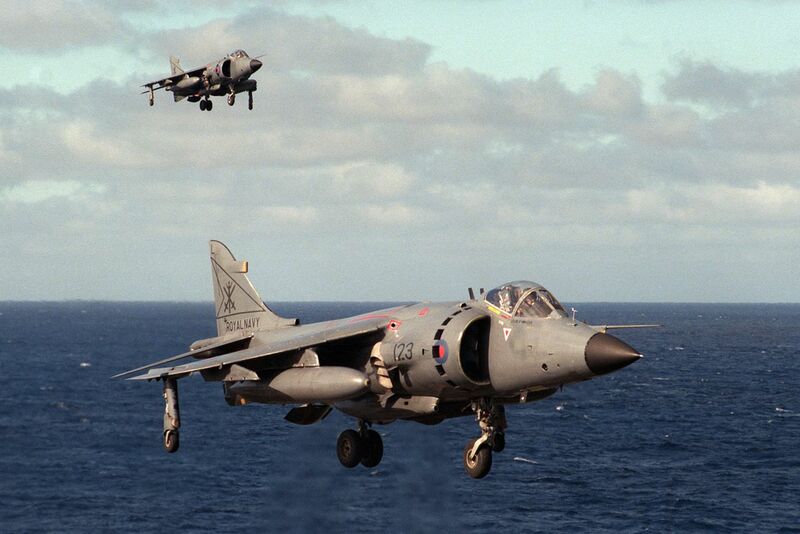 The 6th saw tragedy strike for the Task Force, when a pair of Harriers sent to investigate a contact flew into a thick fog and disappeared, presumably victims of a mid-air collision. The loss of two of the precious Harriers, and their pilots, was a serious blow to the Task Force's ability to launch strikes while maintaining sufficient fighters to protect itself. The weather remained bad the next day, with the only real beneficiaries the Sea Kings that were shuttling SAS and SBS recon teams ashore, as it hindered the Argentine defenders much more than it did them. The bad weather also provided cover for some shuffling of the replenishment ships, as more fuel and supplies were arriving with the second wave of ships from Ascension. On the 8th, the Argentine Air Force reappeared. They dispatched one of their 707s to monitor the progress of the amphibious group, and sent C-130s to resupply Stanley. The British scrambled Harriers twice to intercept, but VYCA-2, the Argentine ground control group, routed the transports clear. That evening, to cover the attempt to tow Sheffield to South Georgia, the British launched a series of attacks on the islands. The frigate Alacrity was dispatched to bombard Stanley, firing 90 rounds of 4.5" into the Argentine positions. Brilliant patrolled Falkland Sound, between East and West Falkland, and sent a helicopter to bother the defenders of Port Howard in West Falkland. Harriers dropped flares over other defenders, successfully distracting them. The scheme to tow Sheffield proceeded without Argentine interference, although the ship was lost due to flooding the next day. On the morning of the 9th, Coventry and Broadsword moved inshore, planning to stay off Port Stanley and harass it during the day. The Type 42 would use her gun against ground targets and her Sea Darts to shoot down any transports that tried to make their way inshore, while the Type 22 would protect both ships with her Sea Wolf missiles. They were also to control the CAP of Sea Harriers, and when the aircraft appeared overhead, they reported a contact 50 miles south. They were sent to investigate, and reported an Argentine trawler, the Narwal. Narwal had been suspected of being a shadower reporting on the movements of the Task Force, but had been left alone as she was wearing a merchant ensign. The rules had changed that day, though, and the Harriers bombed and strafed the trawler. One of the bombs missed, but the other hit and lodged in the engine room without detonating, as it had been dropped from an altitude too low to allow the fuze to arm. The Argentine crew abandoned ship, and three Sea Kings were dispatched with a prize crew. They encountered little resistance, and captured not only the Argentine officer in charge of the trawler's mission, but also his orders. 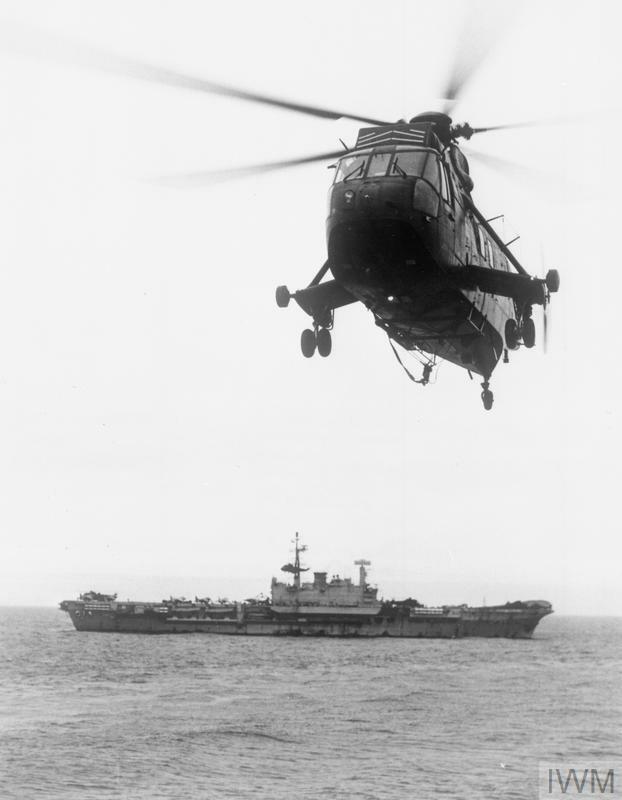 On the return journey, one of the helicopters ran short of fuel and had to land on the deck of Glasgow, which was designed for the much smaller Lynx. The pilot managed to do so safely with less than three feet of clearance for his rotor blades. Meanwhile, Coventry and Broadsword had also been busy. While bombarding the airfield, Coventry had picked up three radar signatures and engaged them with Sea Darts. All three of the missiles missed, although there was some confusion about this, as two Argentine A-4s crashed in bad weather that day. Later that day, Coventry detected an Argentine Army Puma, and this time scored with a single Sea Dart, shooting the helicopter down. Shortly afterwards, the "Type 64"1 was relieved by another, composed of Glasgow and Brilliant. Alacrity and Arrow took up position off the inlets to Falkland Sound, and the Lynxes of all four ships spent the evening hours patrolling the coastline of the islands, but found nothing and drew no fire. The early hours of May 10th saw the weather take a turn for the worse, and Sheffield and Narwal both sank, the damage they sustained exacerbated by the rough weather. The storm prevented Harrier operations, although helicopters continued to fly, hunting submarines and spotting for Glasgow's artillery. That evening, Alacrity was ordered to pass through Falkland Sound from south to north, a hazardous task in the narrow, rock-strewn waters. Shortly after midnight, the risk was rewarded when the frigate detected a ship near the coast of West Falkland. An attempt to illuminate with starshell was not entirely successful due to the very low cloud base, but it was swiftly determined that the vessel was the Argentine Isla de los Estados and Alacrity opened fire with her 4.5" gun. The Estados was carrying jet fuel and ammunition, and began to burn almost immediately, exploding less than 15 minutes after the battle began. Amazingly, the Argentine garrison apparently didn't notice this, not realizing what had happened until two survivors were rescued on the 13th. They were not the only ones to display surprising ignorance of an enemy attack. 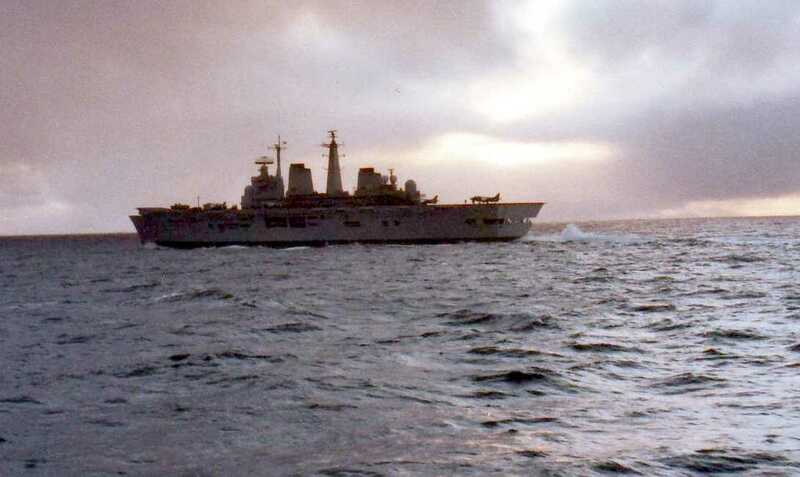 The Argentine submarine San Luis had been hanging around near the Falklands for the previous month, and finally got a solid chance to make a kill when Alacrity met up with Arrow at the north end of Falkland Sound. Computer problems limited the submarine to one manually-controlled torpedo at a time, and while the boat's crew managed to land what they thought was a hit, neither frigate noticed that anything had happened. Later, Arrow’s towed torpedo decoy was recovered, and it was found to be damaged. At the time, it was believed to have been damaged by a rock, but it is possible that it saved the ship from the torpedo. However, postwar investigation revealed serious problems with Argentine torpedoes, including fusing and guidance problems that might have kept them from going anywhere close to their target. In any case, this was San Luis’s last shot, as the submarine returned to base later on the 11th. Argentina's other submarines were not operational due to maintenance problems, and San Luis didn't manage to get back to sea until the war was over. The first week of the siege saw a fairly even exchange of honors. Both sides had lost a few airplanes, and the British had done some damage to the Argentine position. But the amphibious group was still a week away, and there would be more travails on both sides before it arrived and the battle moved ashore. This is about the best short-but-detailed account of the Falklands War I have read. Many thanks.